Haldex Concentric, the leading supplier of diesel engine pumps, has been awarded Caterpillar's prestigious Supplier Quality Excellence Process (SQEP) silver award in its USA plant located in Itasca, Illinois. This is the second year that Haldex Concentric has qualified for an award, advancing from bronze level in 2008 to silver in 2009. Caterpillar's SQEP programme is designed to place special emphasis on supplier performance excellence and certification is awarded only to suppliers that have achieved the highest levels of quality, delivery, process control, and six-sigma. 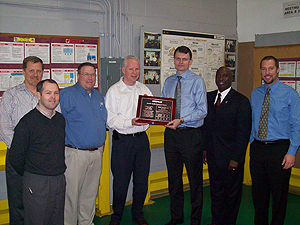 Caterpillar Global Purchasing representatives visited the Itasca plant on January 28th to present the SQEP silver plaque to Len Mason- Senior Vice President and the entire Itasca team. Mr. Mason commented: "SQEP is extremely rigorous and requires us to demonstrate our process control capability and 6 Sigma discipline in driving continuous improvement. Achieving the silver level is an outstanding achievement and a measure of our absolute commitment to world-class capability. I am particularly happy that the excellence and commitment of our workforce has been recognized in this way."